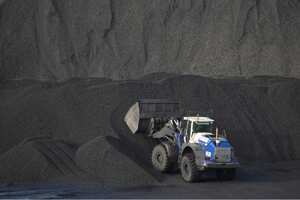 New Delhi: The Mines and Minerals (Development and Regulation) (MMDR) Bill, which seeks to replace a decades-old mining law, was introduced in the Lok Sabha on Monday, but may become law only by next year as a parliamentary committee is now expected to examine it over the next few months, a mines ministry official said. The government has drafted the MMDR Bill over many months with the objective of boosting production of much-needed mineral resources in the country with greater transparency and quick approvals than before. The draft Bill also seeks to empower the Central and state governments to enable better regulation of the sector and to combat illegal miners and Maoist insurgents impeding its development. The standing committee of labour and employment has been entrusted with the task of studying the Bill, being seen as an overhaul of the original MMDR Act of 1957. “The standing committee will take a few days to get the Bill," said Hemanand Biswal, Congress party’s member of Parliament from Sundargarh in Orissa, who is the chairman of the standing committee. The most debated aspect of the Bill is its recommendation for substantial payouts to people living in mining areas, including a profit-sharing clause that seeks to have companies pay out 26% of their net profit or an amount equivalent to royalty to the state government. However, political entities have differences over the Bill, with the biggest opposition party, the Bharatiya Janata Party (BJP), still not making its stand on the Bill public. 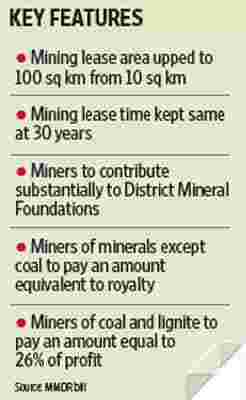 “Our party will make its stand clear on the mining Bill in due course," Ravi Shankar Prasad, chief spokesperson for the BJP, said. He did not say if the BJP will support or oppose the Bill. The mining Bill seeks to establish a district mineral fund that will have representatives from mining companies, government officials and local residents, who will manage the funds and decide where they must be spent. The Bill mandates that the holder of a mining lease pay annually to the District Mineral Foundation a sum equivalent to the royalty paid during the financial year in case of major minerals except coal and lignite. In the case of coal and lignite, an amount equal to 26% of the profit from the preceding financial year will have to be paid to the foundation, it says. The Bill also seeks to allot at least one non-transferable share of the mine to each person of a family affected by the mine’s operation. “The government is actually transferring natural resources to the private sector," said Nilotpal Basu, a member of the central committee of the Communist Party of India (Marxist). “That is becoming a major cause for corruption. We are not confident about how profit will actually be shared with local people and how they will benefit," he said.